Next week school reopens in my part of the world. After 2 and a half months of late nights, later mornings, lazy breakfasts, no school lunches, no worries of homework, unlimited story book reading time and any hour ice cream time, letting go of summer vacation is not going to be easy. For anyone.Okay, at least not for me. Though I was not at the receiving end of those sleep-in mornings and unlimited ice creams, it is my heart that squeezes in this awful manner, thinking of a summer that is slowly gathering up the hem of its laced skirt and preparing to say good bye.This summer has been one of those very laid back kinds, with minimum activities, no summer camps and the girls free to do what they want with their day. Well, for the most part. There have been several sleepovers, couple of picnics, multiple park visits, visiting friends in neighboring states, grandparents, beach, water parks, a short trip and a birthday party in the park for LittleSis. Nothing else was planned or chalked out and not once did they say they were "bored". BigSis of course read and re-read many books from Percy Jackson to Harry Potter, from the Malory Towers series that my Ma got to some Agatha Christies. LS learned to read pretty well but is yet to get hooked onto its magic, so she kept herself busy with imaginary games involving complex rules, which take more time to explain than play. I think they had a good summer, kind of like those I had,only with air-conditioning. Listless, long, timeless. And now here we are, with school starting on Monday. The prospect of two school buses at my doorstep for the two sisters, wrenching my gut. Darn, I am hitting menopause or what. The supplies have been bought and labeled by BigSis. The bags have been packed. This is always an exciting part of a new school year though in this case there are no new text books involved. Supplies largely consist of Sharpies, Folders, glue sticks, pens in certain colors, post-its and index cards. For LS it is glue sticks, crayons, glue sticks, color pencils, more glue sticks and did I say glue sticks ? I have no idea what they do in Kindergarten but it sure involves a lot of glue sticks. The start of a new school year was always exciting during my school days too. One of them was the new pencil box, which was a coveted treasure and the one thing where my parents gave in to fancy renditions. So I had those magic pencil boxes where the contents would disappear if you opened it a certain way, the two tier ones with Mickie on top, the ones where the scale slid on and doubled as a cover and then shiny camel geometry boxes every year.Close second, were the new text books with their fresh smell and crisp pages and the Radiant Readers or Gulmohars with their new stories to leaf through. There was also the act of covering each of them with brown paper. A daunting task which my Mother finished for the most part. While in the last few days of vacation, I would be busy completing the handwriting homework I had conveniently procrastinated, Ma would be sitting down with rolls of brown paper, a ruler and a pair of scissors, neatly covering each of the text books. I mostly covered the notebooks and then patiently drew lines on each of those covers to pencil in my name, classroom and section. BigSis has these things called book socks to cover her text books, the books that the school provides for the school year. The books mostly stay in class and are to be returned when she moves up. I don't have to pay for them. They are not new. But they are extraordinarily neat with no scribbles on the margins. However I see, she does not feel the oneness with these text books that I once did with mine. I would worry even as the brown paper cover frayed at the ends and started tearing at the spine and never ever leave them face open or upturned. She keeps the books neat but they are not hers to be highlighted, underlined or to make notes.Naturally so she does not feel for them with her heart either. They are just textbooks for the new school year. It is the folders, pencils and binders which excite her more. And then there are the glue sticks for LS. All six of them. Before I go onto the recipe, I must tell you about this wonderful event where my book is a part of the giveaway. It is hosted by Srivalli of the wonderful blog "Cooking 4 all Seasons". You can participate and try to win a copy. My book is now also available for UK/Europe/Canada on Amazon at the Amazon.uk, Amazon.ca etc. And it is always there on Amazon and Flipkart. If you have read my book, I would also urge you to rate and review it at these sites as well as on Goodreads. It will be a huge help. Soon, I will be having a couple of giveaways on my blog too. So stay tuned. Now to Doi Machh i.e Fish in a yogurt gravy features in my list of favorite dishes. 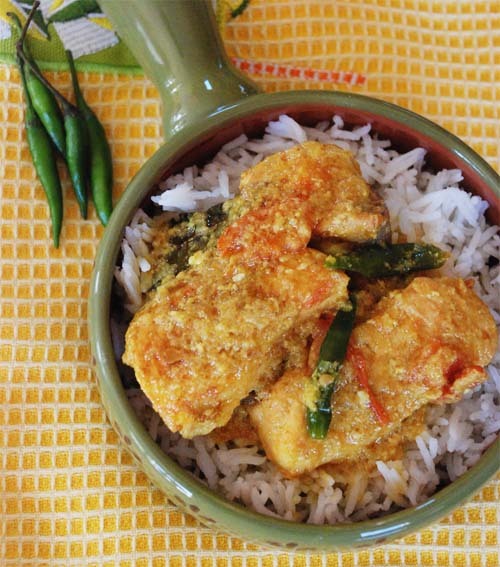 Surprisingly this simple dish varies from one Bengali home to the other in the little nuances they add. My Ma’s Doi Maachh is pretty much traditional with raw onion paste, ginger paste and yogurt in the gravy and that awesome taste is what I grew up with. Then, when I saw my Ma-in-law add chopped tomatoes to this gravy, towards the end of cooking, I was taken by surprise. But her dish tasted just like Doi Maachh and yet was unique with this touch. When it was my turn, I went further. Instead of a raw onion paste, I started sautéeing the onion lightly and grinding them to a paste which I then used in the gravy. I was trying to shorten the time it takes to “kashao” raw onion paste. Simple. In my book, I have a version of Doi Maachh where I have added even more twists and turns. 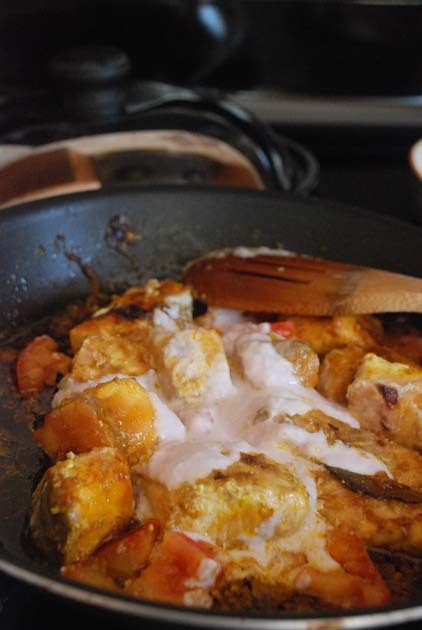 Though traditionally done with fish like Rohu or Carp, I find salmon perfect in this sweet and spicy yogurt gravy. Today, I will share with you my version of Salmon diye Doi Maachh, where the salmon is poached in the gravy and the taste is so darn awesome that my daughters lick it up. And I am sure you will love this too. 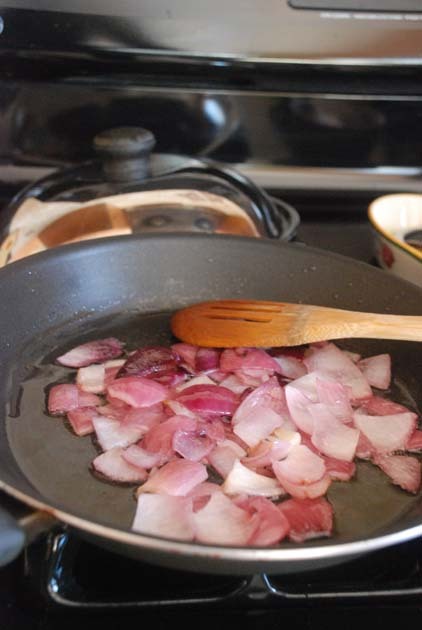 Chop a medium sized onion in large chunks and then saute it until it is soft, pink and translucent. Now cool and make a paste. 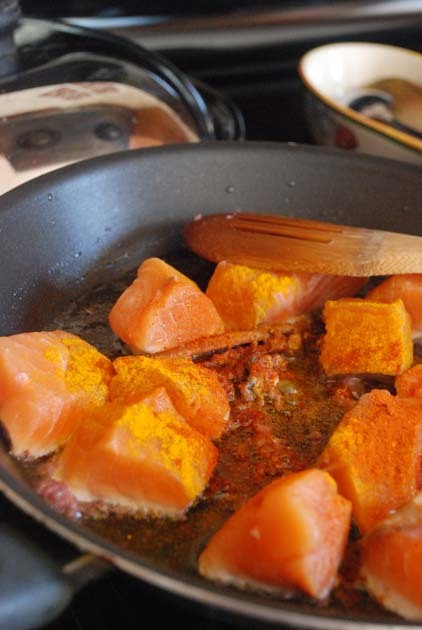 Clean the fish pieces and lightly rub with salt and turmeric. Keep aside for half an hour. For salmon, I request the fishmonger to get the skin off the filet and then cut the filet into kabob sized pieces. 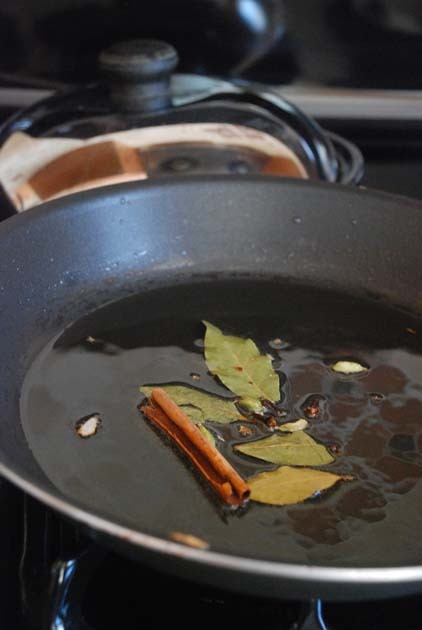 Heat some more Oil in Kadai/Frying Pan. When they start sputtering add the remaining onion paste. 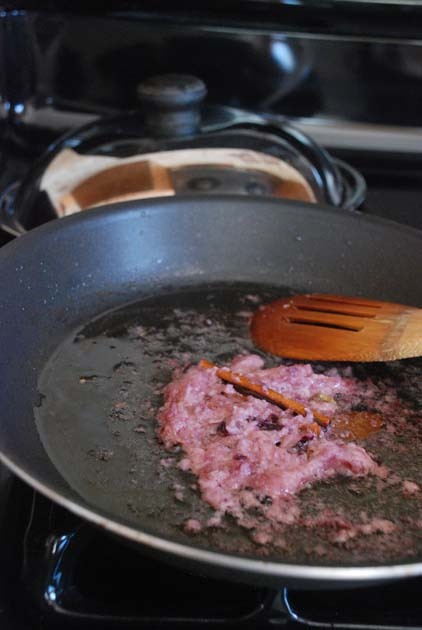 Add about 1 tsp of sugar and fry the onion paste till the oil separates. Next add half of a large tomato chopped into small pieces and about 5 slit green chillies. You can also add halved grape tomatoes. Now take the Kadai/Frying Pan off the heat and give it a couple of minutes to cool. Add the beaten yogurt/curd and mix with the fish. If you add the yogurt directly when the utensil is on heat the yogurt may curdle so you need to do this. Put back the Kadai/Frying Pan on heat. Add salt as required .Add about 1/2 - 2/3 cup of water at this point. depending on how much gravy you need, you might need more or less water. Finish off with a little ghee if you wish and a little Garam masala powder. Serve with white rice. 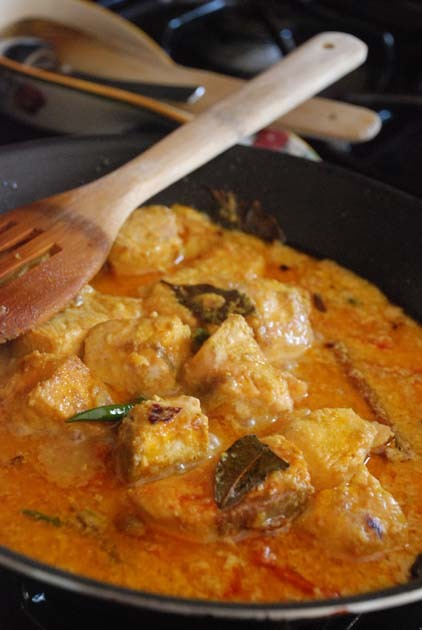 I love the pan you cooked in.What brand is it?Can you get it in US or is it from India? One of the fish we make ehre is salmon , though i make them always western style. I must make like this. Here Hans is back to work too after summer holidays and Shyama is still home but then she goes to her friend etc... Looks like kids and you all had a good summer. I miss those days of the first week of school from shyama with the excitment of new books covering them etc. Labels, labels, you didn't use labels? That was such fun, choosing labels. I forgot about them till I read your post! Tried asking this- but not sure if it went through. How many pounds of fish have you use for this recipe? Thanks! I have tried this yesterday......and it was just awesome.My hubby is becoming your big fan than me. Thanks. How long should it simmer? 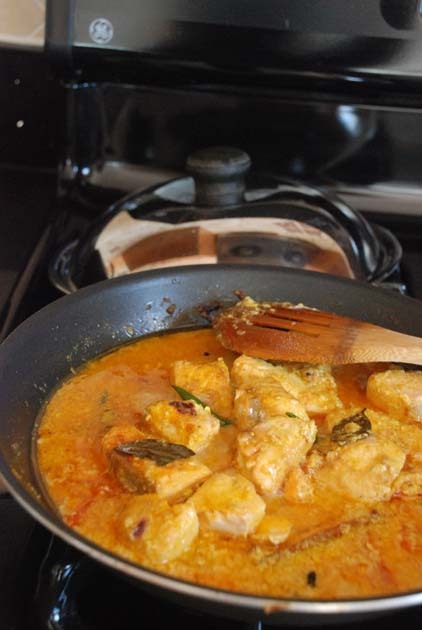 Bong Mom: whenever i cook any indian-style fish recipe with salmon, it turns really dry and does not absorb any flavors from the sauce. Do you know why? and this para from your write up above really touched my heart: BigSis has these things called book socks to cover her text books, the books that the school provides for the school year. The books mostly stay in class and are to be returned when she moves up. I don't have to pay for them. They are not new. But they are extraordinarily neat with no scribbles on the margins. However I see, she does not feel the oneness with these text books that I once did with mine. I would worry even as the brown paper cover frayed at the ends and started tearing at the spine and never ever leave them face open or upturned. She keeps the books neat but they are not hers to be highlighted, underlined or to make notes.Naturally so she does not feel for them with her heart either. They are just textbooks for the new school year. but I've always enjoyed eating spicy spicy fish curry with some cook yogurt and steaming hot rice...Oh! its superb. And I love this variation in your preparation, I should give it a try sometime. This recipe looks so good, and I want to try it. Couldn't find the amount of fish you used for this dish...did I miss it somewhere? Would appreciate if you could clarify. Thanks! My bad. I would say about 1.5 to 2 lb of salmon, usually 2 fillet if I get it from ShopRite but 3/4 th of one if I get from Costco. Hey... my husband loves fish but i cant eat it. however i have decided to cook this particular dish for him. i have never cooked with a fish so could you tell me for how much time am i supposed to cook the salamon? Also any other fish that could be used in case i dont get hold of salmon??? Hi Sandeepa, your blog is such a treat. And so is your book. Meeting the husband's great-aunt tonight and I was asked to make fish for her. Just made this, and my god, it is amazng! Thanks, you just saved my life! My mil's recipe was pretty basic, and yours is going to be a surefire winner tonight! Also, thanks for the tip about adding the yogurt off the heat - I always wondered why it curdled! Again, thanks, thanks, thanks! As a non bong married to a Bengali, you have helped me evolve into this awesome bong chef. Many thanks and keep the recipes coming. I have made your shorshe prawns, mangshor jhol, doi phulkopi and don salmon. Next on the list salmon kalia Just as you have illustrated. Thank you again and please keep the recipes coming. Sandeepadi...seems a great recipe. If you hang the curd you would get a thicker paste which I think suits the fish better...and I like the gravy on the more lemon side. I have been waiting for your doi hilsa recipe for while and I hope you will post up. I cook with my two kids sitting in Saudi Arabia and your dishes are quite unique. this recipe is excellent and a keeper! 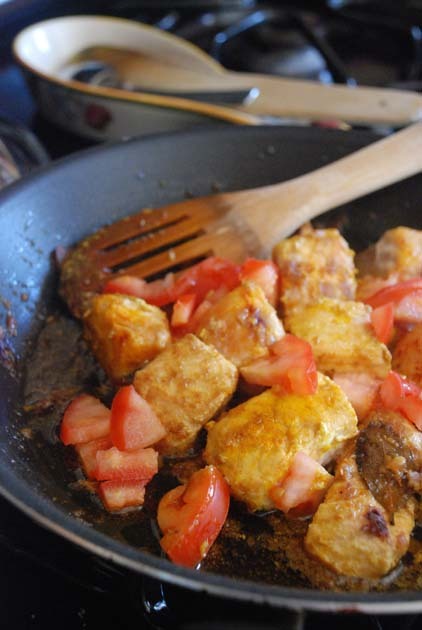 i added one extra onion while cooking because i like more masala :) i will try this with paneer instead of salmon next time to see how it turns out.. great job bongmom!